OMG!!! 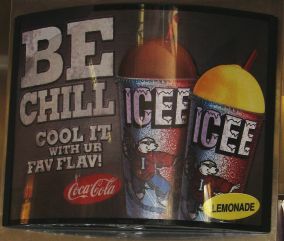 The local Burger King Slurpee machine sez: “cool it with ur fav flav.” Lolspeak is in ur multi-national! Corporate America can has teh funny? No wai, only wants sell cheezburgers! Co-option of kulcher? Mebbeh. Or mebbeh teh kittehs win! Mai theweh, let me show you it. Lolspek is awsum meme, like new languish, even haz dik-shun-ary. Teh hoomans who lieks kittehs lieks cheezburgers too, so teh burger stoar lurnz lolspeaks. But mebbe if enuf mawket-urs has teh lolspeak, iz not “authentic” n e moar? I doan no! Kwestions of “authenticity” in kulcher make mai hed asplode!